If you are a sysadmin, dba, network administrator, or someone who is responsible for keeping the IT infrastructure up and running, the following might sound familiar to you. You don’t know when you’ll run out of disk space, or when the server will go down, or when the database will crash, or when one of the critical services running on the server will fail. You are worried that right people (or team) are not getting notified about the server or services issues at the right time. You (or your team) are constantly working on finding and fixing issues as they show up. Nagios Core 3 is an open source, easy to learn and implement, extremely configurable monitoring solution, that can monitor your entire IT infrastructure: OS, DB, hardware, software and services. In addition to monitoring, it also notifies the appropriate owners or managers of the hardware, software, or services about potential problems before they become critical issues. This eBook is the only guide you’ll ever need to get your IT infrastructure monitored using Nagios. I promise it will help you understand everything you need to know to implement Nagios Core 3. Chapter 1 – 5 explains how to install and configure Nagios, and how to monitor both remote Linux hosts (using NRPE and SSH) and Windows hosts (using NSClient++). Commonly used Nagios check commands are described, with clear examples. Chapter 6 – 9 explain Nagios configuration files, Individual configuration objects, group configuration objects, and advanced configuration objects with clear examples. Chapter 10 – 11 describe the Nagios Web interface and security. Who should use this eBook? This book is targeted towards users who are new to Nagios Core 3. This book is for system administrator, database administrators, network administrators, IT Managers, or anybody who is responsible for keeping the IT systems up and running. I’ve been using Nagios for several years, and I can sleep peacefully at night knowing that Nagios is monitoring all my systems and will warn me about any potential issue, before it becomes critical. How can Nagios Core help you? You don’t have to buy separate products to monitor your database, monitor your hardware, monitor each type of Operating System. One software monitors them all. The right people will be notified at the right time. For example, sysadmins get notified when the disk is running out of space, and DBAs get notified when there is an issue with the database. You track system and services status from a friendly web interface. None of your system issues need go unnoticed. If admins are not addressing an issue, Managers will be notified. You can take appropriate measures to prevent issues, based on the historical system and services performance data collected by the system. Several custom plugins for various software and hardware are developed and published by Nagios community. Unlike proprietary software, open source solutions are thoroughly tested and reviewed by the community for any potential security issues. The Nagios Core 3 eBook is just $39.95. Nagios Core, the best monitoring solution, is open source software that will cost you nothing. An investment of just $39.95 for this eBook, will change the way how you monitor your IT systems forever. Bonus #1: A sample real life monitoring scenario, along with step-by-step Nagios configuration information to get it implemented. 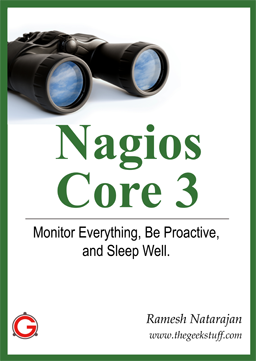 If you are not satisfied with the Nagios Core 3 ebook, just let me know and I’ll refund your money — that’s how confident I am that this book will help you implement Nagios Core 3 in your enterprise and help you sleep peacefully at night. Just think! You can sleep peacefully at night knowing that Nagios Core 3 is monitoring all your infrastructure, that it will alert you even before an issue becomes critical. $39.95 for the eBook (including two free bonus items for a limited time), is the best investment you can make. Click here to get your Nagios Core 3 eBook NOW!